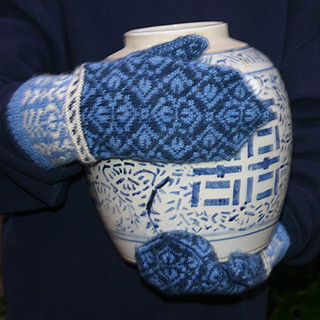 The Tulip Mittens are a circularly knit design suitable for knitters who are experienced with stranded knitting. With an 8½“ finished circumference, they are sized to fit most adult females’ hands. 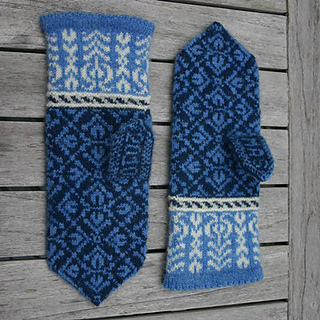 For extra detail and warmth, they are knit using Jamieson’s Shetland Spindrift at a tighter-than-usual gauge. Three shades are used and you’ll need 2 x 25g balls of the medium shade, 1 of the light and 1 of the dark. Charts for the Latvian style “peasant” thumbs include the alphabet and numbers so that you can add your own secret messages inside the stealth thumbs. The yarn pack is available through the designer.